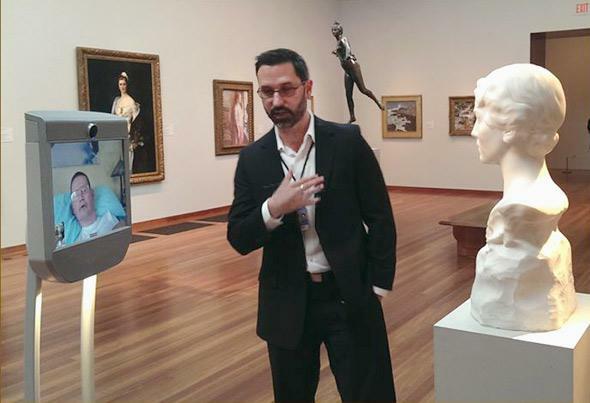 Telepresence robots make museums accessible to everyone. Telepresence robots make it possible for people with disabilities to visit museums. Henry Evans receives a tour via Beam of the de Young Museum in San Francisco from Charlie Castillo, the museum’s director of human resources and administration. Museum-lover Henry Evans has been fortunate. Over the past year, he has been able to take one-on-one guided tours of the National Museum of Australia in Canberra, the de Young Museum in San Francisco, and the Computer History Museum in Mountain View, California, among others. Such museum hopping is not necessarily unusual, of course, but what makes Evans’ experience unique is that he was able to stroll through the collections of these institutions while lying supine in his Los Altos Hills home in California. Evans is a mute quadriplegic. He suffered a stroke in 2002 that left him with minimal powers of movement except for his head, a saving grace that allows him to access the Internet, use a voice synthesizer, and correspond by email via head motions and a special interface. It also allows him to pilot a number of telepresence robots: remotely controlled, mechanical avatars like the Beam, which Evans has used for many of his museum tours. Originally designed by Palo Alto–based manufacturer Suitable Technologies as an alternative to travel for business executives, the Beam is a sleek white machine, with two slender supports rising from a low, wheeled base to hold up a tablet-size screen that displays the user’s face. It’s the robot Evans uses to address a Washington, D.C., crowd in a popular TEDx video from 2013. In the years since his stroke, he has made it his mission to find ways to extend his reach into the world, and when he began inquiring about using telepresence robots in museums earlier this year, he found willing partners. The Computer History Museum in Mountain View, California, and the de Young Museum in San Francisco are actively considering keeping small fleets of Beams on site for telepresence programs that could be open to the public later this year. If Evans’ vision comes to pass, it could radically change the lives of thousands of persons with severe disabilities. But could it change things so radically that it creates a new standard for accessibility? Could telepresence robots eventually become universally required accommodations for disabled persons under the Americans With Disabilities Act or other legislation? Is a fleet of sleek robots coming soon to a Walmart near you? It’s certainly possible. According to Marilyn Golden, a senior policy analyst with the Disability Rights Education and Defense Fund, when the ADA was first passed into law in 1990, the U.S. Department of Justice regulations included a definition of “auxiliary aids and services.” These were methods to make services and facilities more accessible to people with communications-related disabilities and included things like sign language interpreters, providing materials in Braille, and TTYs—text telephones—for the hearing impaired. In 2010, the Department of Justice made an update to its regulations that took new technologies into account. This could provide a model for a future update in which the Department of Justice might add telepresence robotics as an auxiliary aid, according to Golden, requiring they be made available unless they presented an undue financial or administrative burden on an organization. A large retail chain or major metropolitan museum might be required to maintain a fleet of robots, but the myriad one-room local history museums in small towns across the country might not. Telepresence robots are not the only technology out there that has the potential to revolutionize accessibility—the Food and Drug Administration just approved a special exoskeleton that enables those paralyzed from the waist down to “walk” again, and a biotechnology breakthrough could find a cure for such spinal cord injuries. Yet, while an exoskeleton is a technology with a very specific and limited market, telepresence robots can appeal to a much broader user base and are commercially available today. Henry Evans at home with his wife, Jane, and son Mike. There could be a downside to success, however. If telepresence robots become such great tools for access, could companies argue they no longer have to make traditional accommodations for disabled customers? Betty Siegel, director of VSA and accessibility at the Kennedy Center for the Performing Arts in Washington, D.C., says that she worried that an overemphasis on remote access might change the fundamental experience at institutions like her own. This article is part of Future Tense, a collaboration among Arizona State University, the New America Foundation, and Slate. Future Tense explores the ways emerging technologies affect society, policy, and culture. To read more, visit the Future Tense blog and the Future Tense home page. You can also follow us on Twitter.